Spring had arrived, but on that day, overnight, Mother Nature took an opportunity to remind us that when it comes to winter's ultimate farewell, it's not exactly packing its bags. A glance out the window showed a pristine landscape that had once again been blanketed with a new cover of fluffy flakes. While it might have been a little disheartening, it was also unquestionably picturesque, a reality that's much easier to accept at the end of the season. There's so much to enjoy at this time of year. We look forward to snow showers turning to rain, which in turn will wash away the detritus left in Old Man Winter's wake. We know that soon, yes, the skies will be crying. But that goes hand in hand with sprouting flowers and trilling birds. The heaviest of our cold-weather duds will be packed away and lighter, breezier fashions will find their way back to the closet. The landscape will brighten, the grass will green and trees will bud. It's unlikely that much of that will happen before our relatively early celebration of Easter this year, however. One can always hope for sunny skies and balmy breezes. Yet even if it doesn't happen we can still look forward to the air of excitement and wonder that accompanies my contingent of beautiful grandbabies all of the time, let alone when something celebratory is happening. 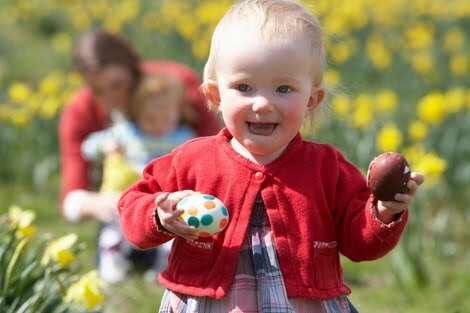 Since five out of six of them are under the age of six, the year's Easter egg hunt promises to be oodles of fun. And in the hope of contributing to that as much as possible, I started early searching for games and goodies to make their quest even more entertaining. Undoubtedly, Easter is first a religious celebration, one of the holiest on the Christian calendar. It's intended as a time of mourning and reflection, as well as a time to rejoice. But on the flip side, it's a holiday that captures the imagination of little ones. It is carefree fantastical fluff, with images of soft bunnies, downy chicks and painted eggs. After a dreary, grey winter, Easter's pastel and vibrant hues put us in a playful mood. Sporting light and airy spring duds we venture outdoors for festivities like the annual hunt. The joyful smiles, the delightful giggles and lively exuberance of a pack of little ones scampering like bunnies to discover what's been hidden in the various nooks and crannies of the garden, are as uplifting as spring itself. Little Missy, the elder of our young crew, is clearly team captain on outings. She's first out of the gate and always first to discover. But as a true leader, she's equally happy to help those smaller than herself. Watching her encourage and guide them is absolutely heartwarming. Her brother, nicknamed Little Mister of course, is full of mischief and action. He's a confident, mildly chaotic hunter/gatherer, who takes delight in distracting the others with charm and shenanigans. An alluring scamp full of smiles and impishness it's quite impossible not to watch him and laugh. Sweet Bean, who's just a week younger than Mister, sees the world with eyes full of wonder. She takes a cautious approach to hunting, not wanting to miss one amazing thing out there. Her awe at each discovery often puts her behind the pack as she pauses to appreciate what she's found rather than rushing on to the next. Our tiny Lola's face brightens at every opportunity to follow her three older cousins around. At two, she is eager to participate. As is her little 'buddy'. Having recently celebrated his first birthday, the youngest of the crew shows in his body language exactly how excited he is to get those legs moving and join the fun.